My name is Nancy Gleason, and I’m addicted to coloring! 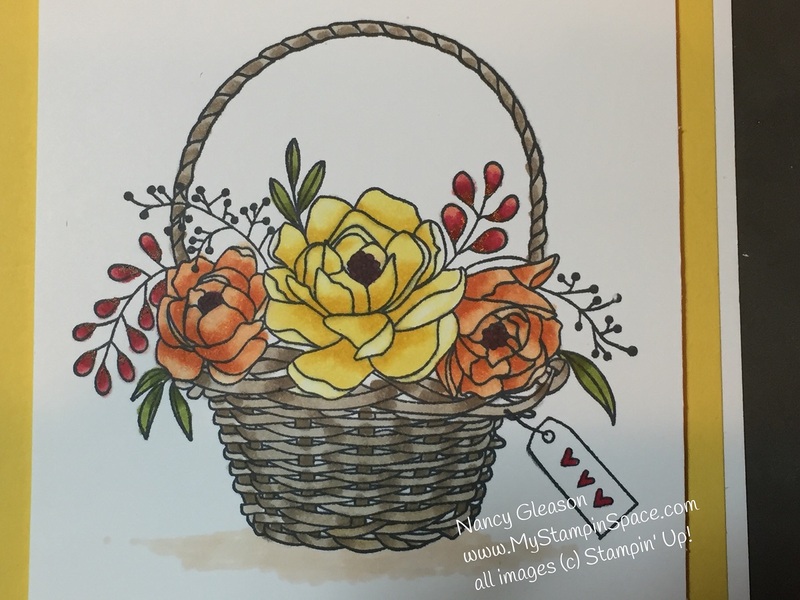 Adult coloring is such a popular hobby but when you are coloring with the Stampin’ Blends markers and the new stamp sets from Stampin’ Up!, it’s like adult coloring on steroids! And I’m not ashamed it’s created an addiction! The coordinating Basket Weave Textured Impression Embossing Folder has a deep texture that is just the perfect compliment to this basket. I added some ink to the TIEF to create even more depth! 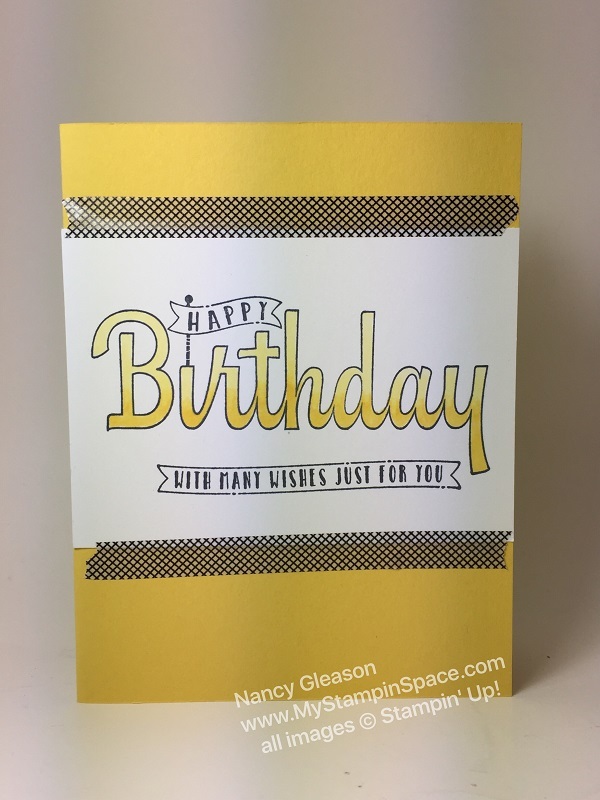 A 2″ strip adds just enough texture to this card. 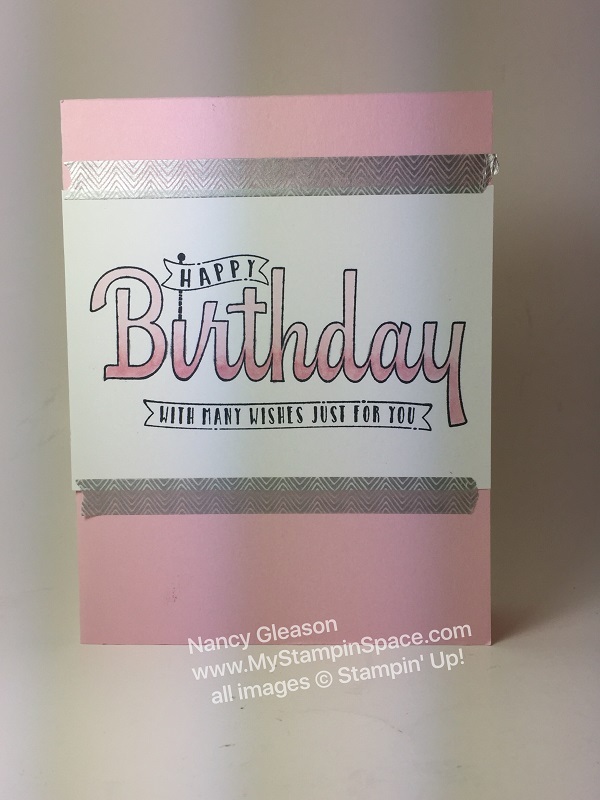 The more I use the Stampin’ Blends markers the more I love them! Look at the shading you can achieve: I used Crumb Cake for the basket, Daffodil Delight on the large rose, Calysp Coral for the smaller roses, Cherry Cobbler for the berries, and Old Olive for the leaves. A small swipe of Ivory under the basket helps to ground it. 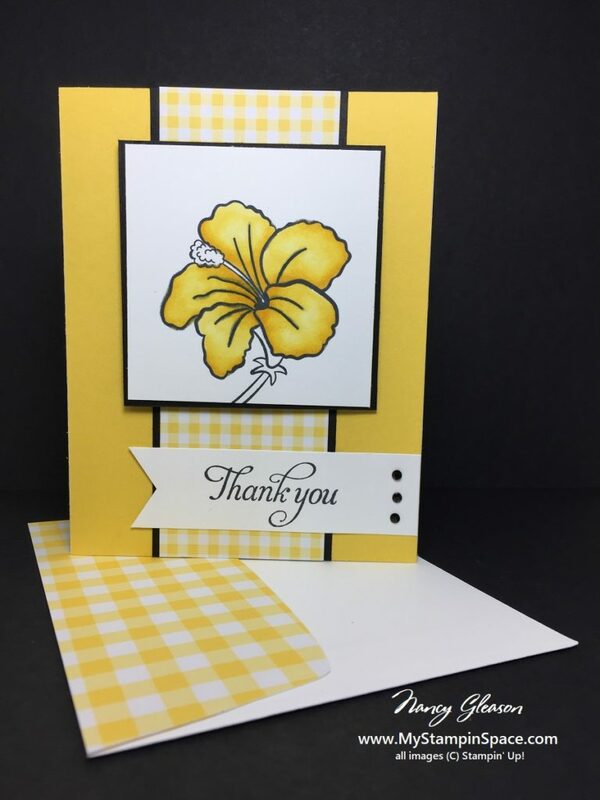 Have you tried the Stampin’ Blends yet? I can’t get enough of them! You can see some other projects I made with Stampin’ Blends here and here. Come back again as I’ll have another card that I made with this stamp set but in a totally different color combination. This is the stamp set Blossoming Basket that is available for free during Sale-A-Bration with a qualifying order. You can always order Stampin’ Blends to qualify for this stamp set which comes bundled with the Basket Weave TIEF. 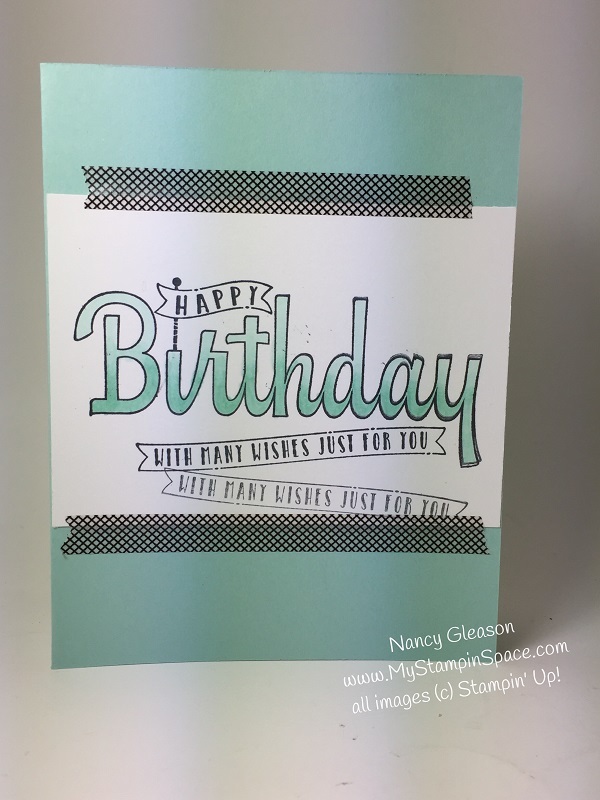 You can watch a video from Stampin’ UP! 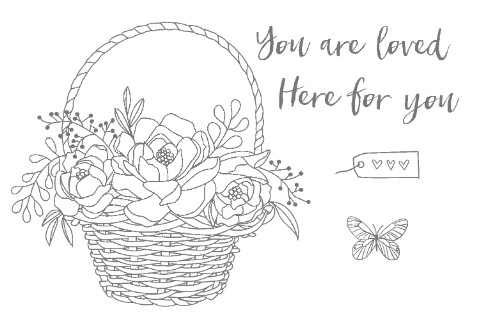 here on the Blossoming Basket bundle. Click here to place an online order now. So much to color and not enough time to do it! Too bad I have to go to work every day! I’d rather stay home and stamp and color all day! That would be much more fun, don’t you think? After looking at what you can do with Stampin’ Blends markers, it’s not really a bad thing that I’m addicted to coloring! 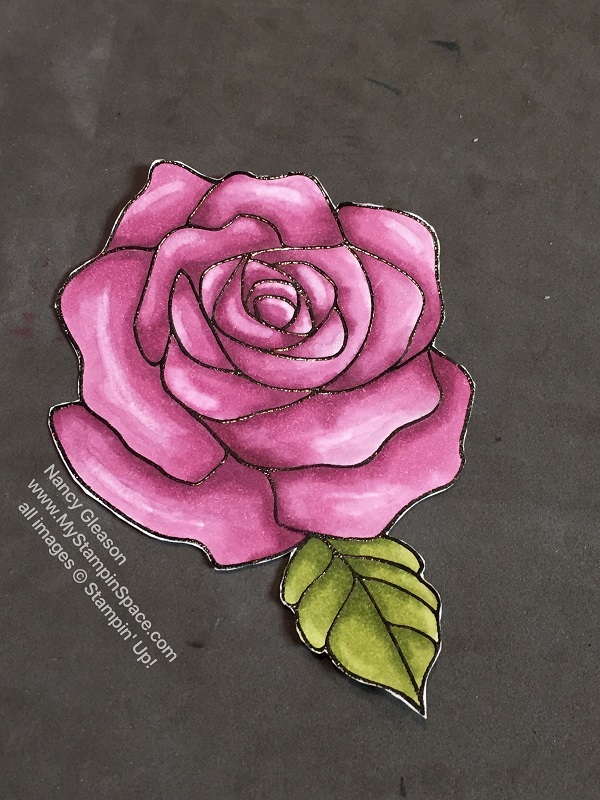 Did you ever wonder what happens when the stamp set Rose Wonder meets Stampin’ Blends? Well, I’m going to show you! Without any further adu, here is the teaser I showed last week. (Yes, I did tell you to check back in a few days for the finished project. A case of the flu set me back about a week! I am feeling so much better now, thank you. ) 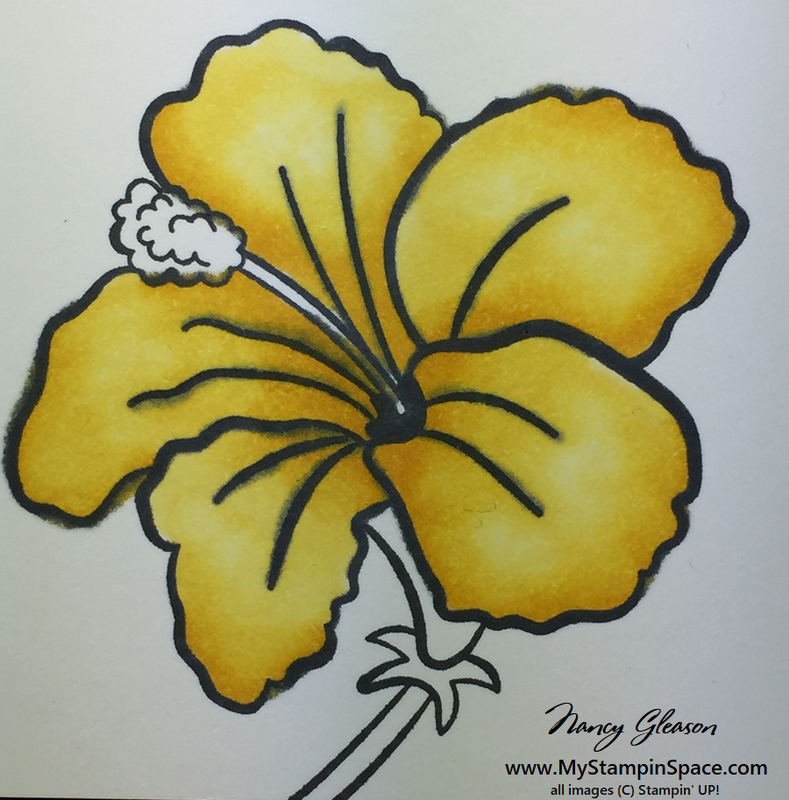 I am just loving coloring with the Stampin’ Blends markers and the remarkable shading and hi-lighting that is possible with these markers. With a light and a dark shade of each color, the stampin’ blends alcohol markers allow you to blend colors seamlessly. The addition of a color lifter allows you to ‘lift’ or remove color to create hi-lights. After coloring this flower, I fussy cut it out. 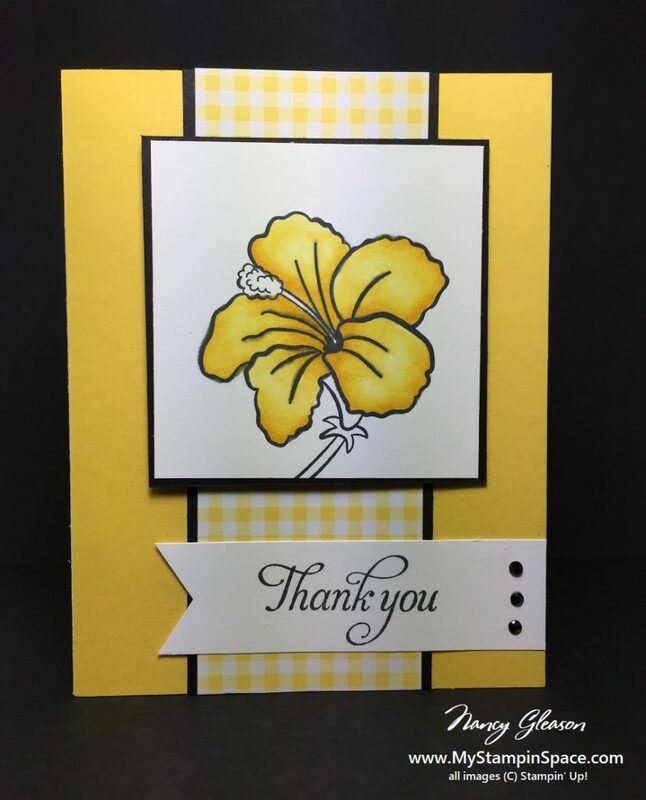 For this flower, I used Rich Razzleberry and Old Olive Stampin’ Blends. 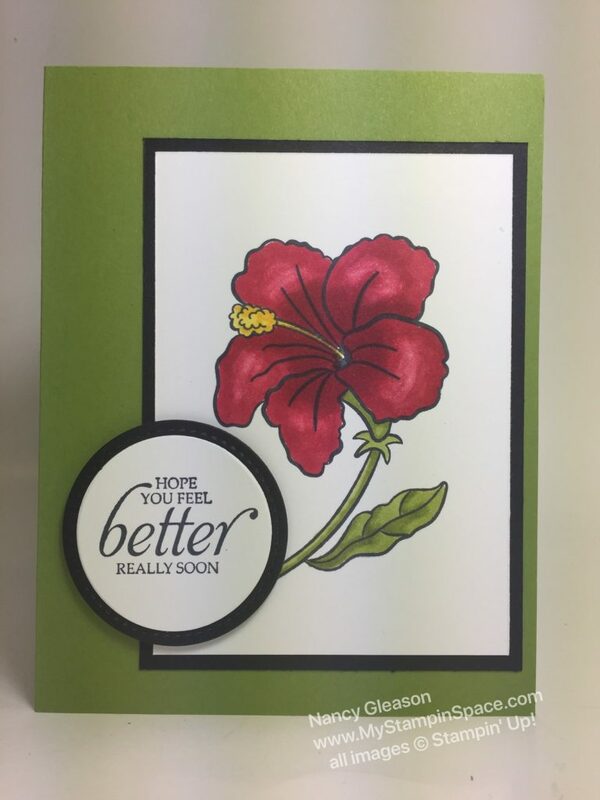 Here is the card I made with that flower: I used embossing paste to create the subway tile look on the background. I like how the black and white make the perfect backdrop to this stunning flower. A little bit of gold thread and gold embellishments add just the right amount of bling without stealing the show from the star of the show. 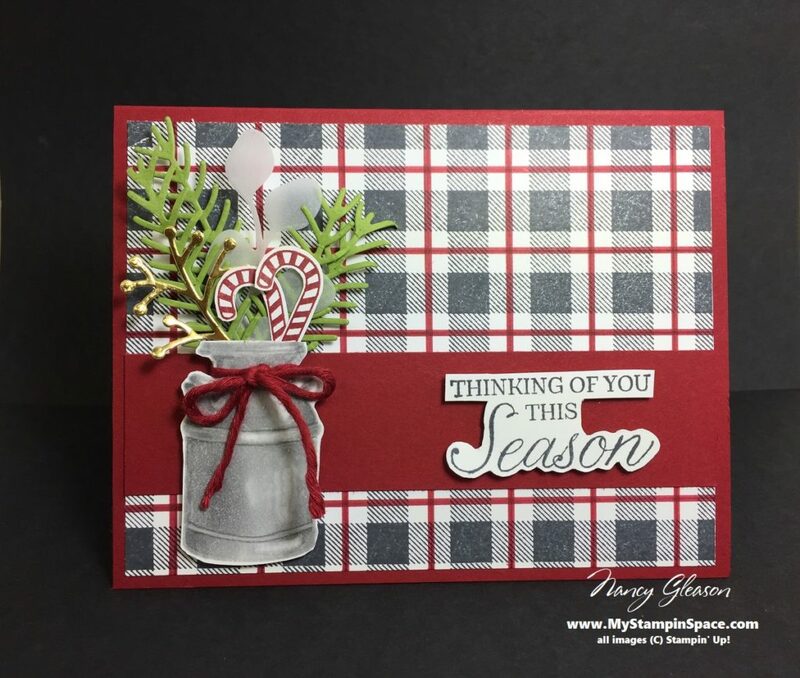 Have you tried the Stampin’ Blends yet? I encourage you to give them a try. 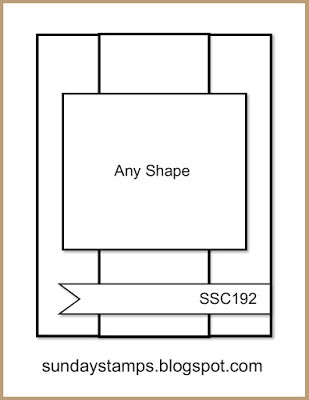 You can get the entire collection of Stampin’ Blends or just pick up a color or two. 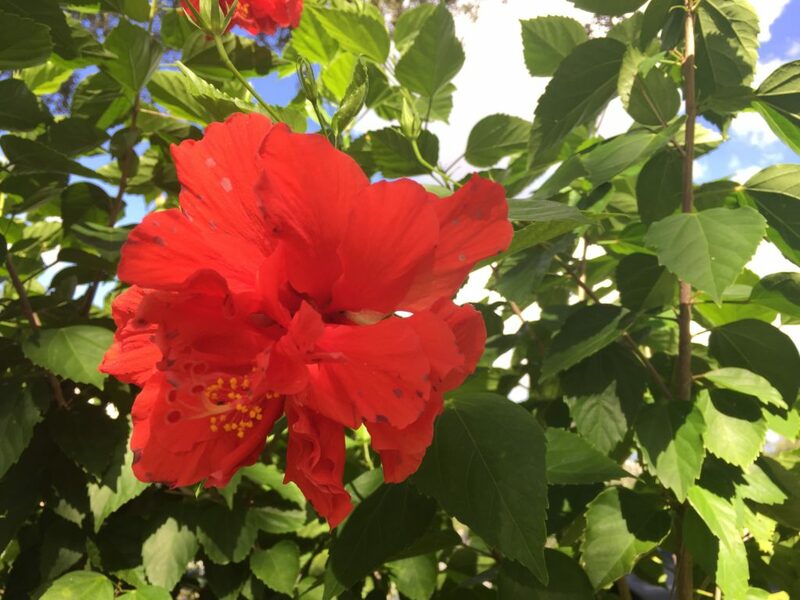 I would recommend a set of Old Olive and a pink or blue or yellow to be able to make a flower, and of course the color lifter. 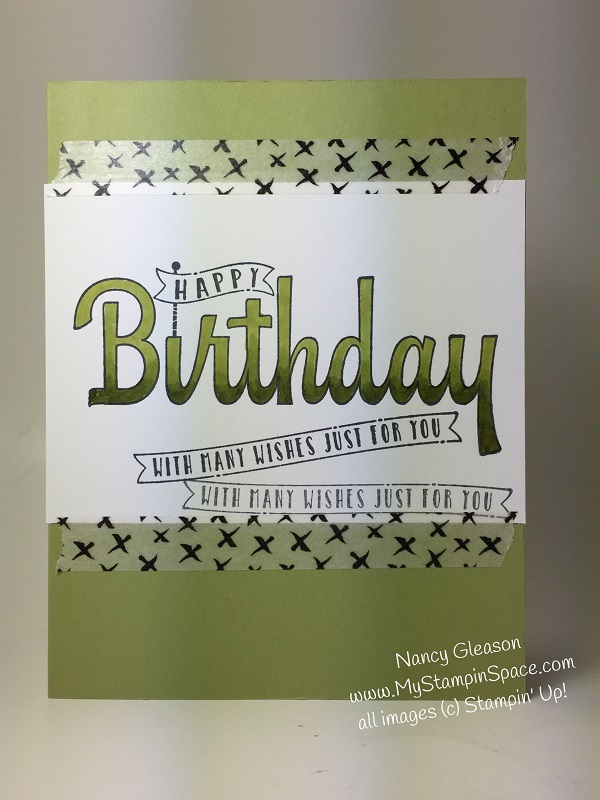 Watch this video to see how to work with the Stampin’ Blends markers. During Sale-A-Bration you will earn a Level 1 reward for every $50 you spend, or a Level 2 reward for every $100 you spend before tax and shipping. Did you see the new Sale-A-Bration items just released? Click Here for the 2nd release. 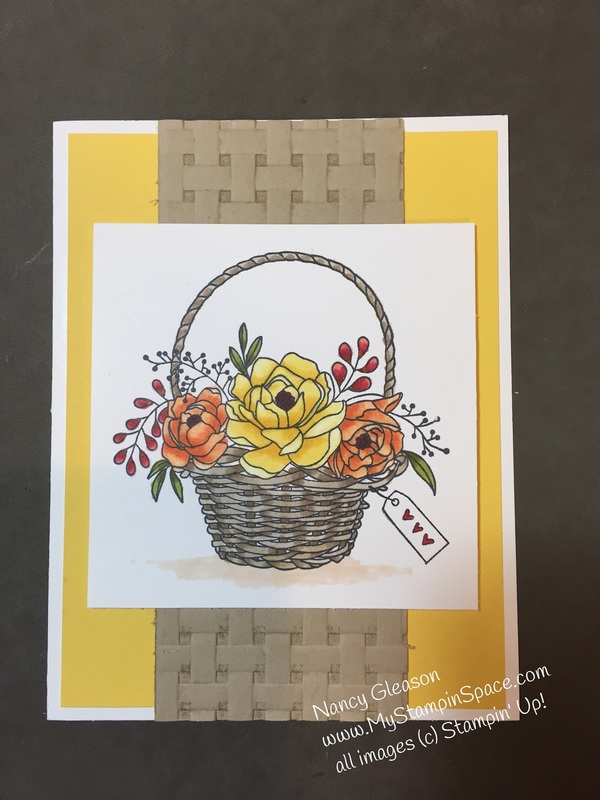 The new Blooming Basket just begs to be colored with Stampin’ Blends! When you purchase the $99 Ultimate Starter Kit during Sale-A-Bration, you can choose $125 worth of products for only $99 plus free shipping, AND you can choose any 2 stamp sets for FREE as well. What will you choose? Decide what you want, then CLICK HERE to purchase the $99 Ultimate Starter Kit. 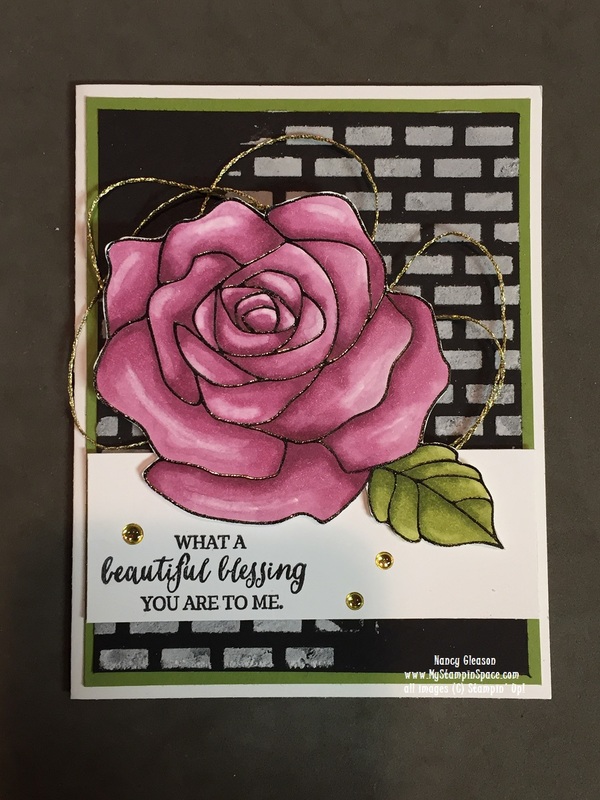 So, what do you think about Rose Wonder meets Stampin’ Blends? Leave me a comment here. I love to hear from you.